Any mom or dad can tell you that keeping up with a toddler can be like running a marathon. The energy level is unmatched while your child is exploring a more mobile world, yet they still need the attention and comfort of being held on command. The chasing, bending and lifting that is part of a toddler parents life can be disastrous for your back. With all the excitement and activity in a house with children, you may not put too much thought into keeping your own body healthy until it is too late. If you are falling into bed at night with sore muscles it's a sign that you could be at risk for a Repetitive Stress Injury. Many of the movements that parents repeat over their day are similar and without proper posture and technique, it is easy to strain your back, hips, neck and arms. Just the strain of carrying an infant in a car seat is plenty of weight for anyone to haul. With improper carrying techniques, strain to your lower back and shoulders is almost unavoidable. There are many light stretches that can be done in the morning and before bed that can help you stay in better shape. Paying attention to your own health is as important a part of being a parent as any other. If you have an injury that is already bothering you then consider seeking treatment soon with one of the many New York Chiropractors that can help you get back on track. For now, take a look at some simple lifting techniques that can lead to a healthier back. Instead of reaching over and down into the crib to reach your child, always lower the outer rail first. Place your feet close to the crib and shoulder length apart for good support. Hold your child close to your body and then lift with your legs and not your back. With the crib rail up, parents tend to bend over and lift entirely with the arch of their backs which can cause lower back strain. Parents will easily pick up their child from the floor over a dozen times a day if not more, so if you aren’t using a proper technique that is a lot of potential for damage to your back, neck and arms. When lifting from the floor take a step forward towards the child with one leg and sink down to your knee with the other like a lunge position or a one legged kneel. Gather your child close to your body and then press back up from the kneel using your legs. 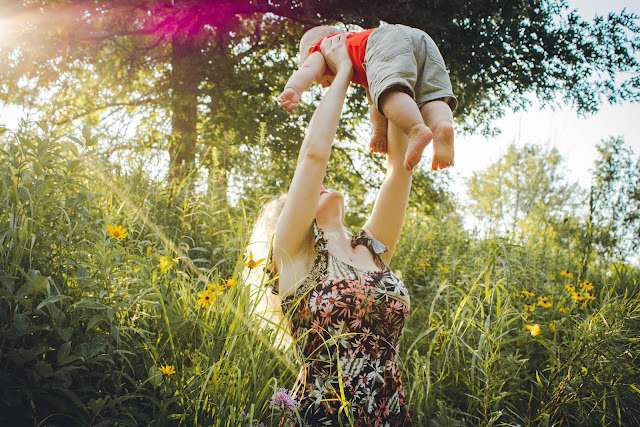 When you carry your child on your hip with only one arm for support your posture will almost always start to tilt to keep your balance. This is one of the most common causes of back strain in parents. The alternative is to hold your child chest-to-chest in the center of your body. Wrap your child's legs around your waist and use both arms for support under their bottom. With today’s car seats that can be removed easily from your car it is easy to confuse this convenience with an immediate threat to your health. Car seats are not designed to be easy to carry and can be awkward just to maneuver in and out of their base. To avoid injury, you should never carry a car seat with only one arm. Instead, carry the seat in front of your body, using two hands with your elbows bend to absorb the strain.